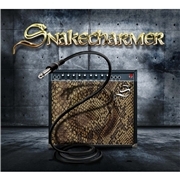 SNAKECHARMER, the name itself implicates WHITESNAKE DNA. And the truth is that there is as much WHITESNAKE here, at least, as in the version fronted by DAVID COVERDALE these days. At least if you´re a devotee of the band´s earlier works – like me. Feature here are Mr. slide guitar himself, Micky Moody, who spent 1977-83 in WHITESNAKE, and well-travelled bass wizard Neil Murray, who served betwixt 1977-87. Reinforcing this endeavor are ex. WISHBONE ASH (1974-85) guitarist Laurie Wisefield, journeyman drummer Harry James (THUNDER, MAGNUM), keyboard player Adam akeman (OZZY, BLACK SABBATH, HEADSPACE) and under-appreciated vocalist Chris Ousey (ex. VIRGINIA WOLF, HEARTLAND, solo). So, will this lot give David Coverdale a run for the money? First up this is not in any way related to latter day WHITESNAKE. Instead this album recreates the atmosphere and the music of the seventies version, or the seventies in general. To my surprise both opener “My Angel” and the next track “Accident Prone” fail to capture my full interest. There is heavy blues rock with grooves a plenty, but not the real spark I demand from musicians of this caliber. “To the Rescue” is a step in the right direction, boosting a fine refrain, but the soft and soothing “Falling Leaves” is spot on and can only be made in Britain. “A Little Rock´n´Roll” is again WHITESNAKE back in 1979, but another slow track feels just uninspiring. On the other hand, they were just getting warmed up. From then on the band delivers high octane blues rock either with force as in “Turn of the Screw”, mid-paced as in “Smoking Gun” or without the feeling or plagiarism at all, as in “Stand Up”. But the best was yet to come! “Nothing to Lose” ought to make David rethink. The steamy old WHITESNAKE blues is totally back, the keyboards make me think of JON LORD (R.I.P) and the rhythm section is simply excelling itself. Album closer is a twin guitar effort, maybe a little something for Laurie to revel in since it´s not quite in the vein of the golden age of the other snake band? I must say I´m pleased to see so many familiar faces back in action and I´m sure this album will …rattle the snake.